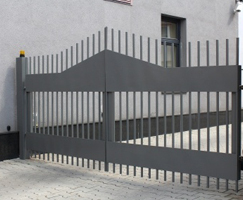 Blog | Are Electric Gates Safe? It is not a secret that electric gates are responsible for many accidents and, in fact, many of them were fatal. Were these accidents the result of bad manufacturing? Perhaps, some of them were but most of them happened because the opener didn't comply with the basic guidelines of UL 325, wasn't properly installed and wasn't maintained right. Think about it! If electric rolling gate openers were dangerous, they wouldn't be allowed to be distributed on the market. On the other hand, they must fulfill some requirements and it is also your responsibility to check what you buy and ensure it is also well-maintained on time. There is also the fear about being entrapped. That's the basic issue regarding the debate whether electric overhead gate openers are safe or not. Since no one can guarantee you how the opener was manufactured, you just need to make sure it is purchased from a good manufacturer and complies with all regulations. It must surely have inherited sensing devices for protection against entrapment and, indeed, according to the latest renewal of the UL 325 guidelines, it must also have secondary sensors. The speed with which the automatic rolling gate is moving must not exceed 1foot/sec. There should be an emergency release cord for manual operation and it would also be good to have back-up drive batteries. It goes without saying that openers are not the only parts, which can cause accidents. Rolling gate repair and frequent maintenance of overhead systems are definitely imperative. Though, when the sensors do not work properly, there is a high possibility that someone could get entrapped and seriously injured as the gate is opening or closing. The smallest problem, from a sweater that got entangled to children's feet among rails, there is a high chance to get involved in accidents and some could be tragic. So, it's best to take precautions. Don't underestimate the importance of rolling gate maintenance. Don't use the vehicular gate to walk in and out on foot and do make sure the sensors work fine. Even if there is something wrong with the opener or its installation, you can fix the problem without getting injured. So, be aware and don't take unnecessary risks!